Director CENIP, Dr. Kayode Akinyemi making a vital point while Prof. Gazal and the five American Students he brought to UNAAB listen attentively. The irresistible urge to behold the beauty of the University of Agriculture, Abeokuta and the serenity of its campus, has led five (5) American Students, “on seeing is believing mission” to the institution. The adventurous students were not only fascinated by the splendour of the University, their love for Yoruba culture has prompted them to adopt its names. The undergraduate of St. Cloud State University, Minnesota, United States, are Claire Williams (Ajoke), Ashley Klein (Olufunke), Karyn Libesch (Jumoke), Joel Bruse (Tokunbo) and Michael S. Bennet (Olawale). 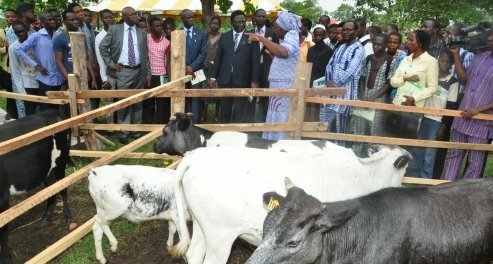 They came visiting at the instance of their Ijebu-Ode, Ogun State born Lecturer, Professor Oladele Gazal, who did his one (1) year sabbatical at the University Institute of Food Security, Environmental Resources and Agricultural Research (IFSERAR) after about 25 years sojourn in the United States. Their journey to UNAAB began when Prof. Gazal, following his return to St. Cloud State University after his sabbatical in UNAAB, started painting an imaginative picture of the beauty and serenity of the institution’s environment while presenting his Sabbatical Report. According to him, “On getting back to my work place, St. Cloud University in Minnesota, United State, I delivered a Report/Seminar of my one year Sabbatical in UNAAB, among other things, I spoke about how beautiful and serene the campus is”. “How friendly and cordial they were, especially at IFSERAR. Some of the students came to see me after the Seminar that they wish to come to UNAAB, Nigeria to see things for themselves and I told them that was an arduous task but the students persisted”. Receiving the students who paid him a courtesy call in UNAAB, shortly after their arrival in Nigeria, the Vice-Chancellor, Professor Oluwafemi Olaiya Balogun, expressed delight at their love for UNAAB and resolve to visit the University. He told them that what Professor Gazal have done with their visit is more of an inter-personal relationship, stressing that a proper memoranda of understanding (MOU) will be signed with St. Cloud State University, USA to foster linkage and partnership. Prof. Balogun stated that with their visit to Nigeria, they are now better re-oriented that Nigeria is a great country of good people and it’s quite unlike the negative perception created by the foreign media. The Vice-Chancellor said that as a Nigerian, he doesn’t like to spend more than 24 hours in the United States whenever he visits because he’s satisfied and happy with the natural endowment God has bestowed on the country. Prof. Balogun told his guests that the Yoruba name they have chosen for themselves have some deeper meanings and circumstances surrounding it at the birth of the bearers.